Brown rice is a natural whole grain that is typically brown in color and has a mild nutty flavor. This particular type of rice is harvested from the seeds of the Oryza staiva or rice plant which are referred to as grains of rice. The method of production is also known as "hulled rice" because it is produced by taking each grain of rice and removing the hull but leaving the brown outer-bran layer in place. Now let's take a close look at the glycemic index of brown rice and other grains. The method used to prepare a serving of brown rice will vary its final GI. The GI for a serving of brown rice is 50 which is even with that of white long grain rice. Foods that are known for turning viscous in the digestive tract will have a lower GI because they will slow the level in which nutrients release into the system. While these 2 types of rice have an equal GI, brown rice is still considered a healthier food than white rice because brown rice contains additional nutrients and fiber. This added fiber in brown rice will make you feel fuller longer which may lower the associated glycemic load. Now that we have known the glycemic index of brown rice, we should make further understanding of the brown rice's nutrition values. Calories. A cup of long-grain cooked brown rice has around 216 calories and the same serving of medium-grain brown rice contains 218 calories. This calorie count is approximately 11 percent of your daily value if you follow a standard 2000 calorie diet. To avoid gaining excess weight you should consume brown rice in moderation. Fat. 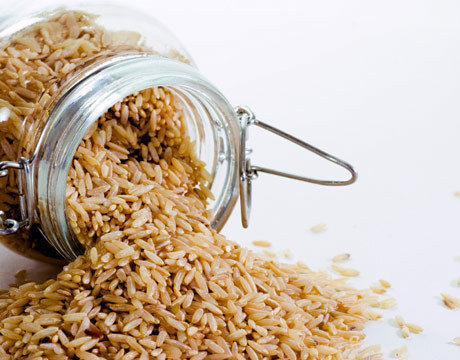 A cup of long-grain brown rice has around 1.75g of fat while a cup of medium-grain brown rice has around 1.6g. This is less than 5 percent of your daily recommended intake, making this a low fat food. Carbohydrates. Both long and medium-grain brown rice contain around 45g of carbohydrates per cup. The average person is recommended to consume between 45-60g of carbs each day, meaning a cup of brown rice contains your entire daily allowance. Cutting back on your serving size would leave more room in your diet for other healthy carbohydrates such as fruits and vegetables. Protein. Brown rice has approximately 5g of protein in each cup, helping you to feel fuller even after a smaller serving. Rice is recommended for those that are trying to lose weight because it can help you consume fewer calories over time. Knowing the glycemic index of brown rice and its nutrition values, now let's explore its function in weight loss and treating diabetes. Low Calories. Because one cup of brown rice only contains 216 calories it is considered an ideal base for a meal for those that are trying to cut down on their calorie intake. Pairing brown rice with a lean protein source such as chicken, plenty of vegetables and a low-calorie and low-fat sauce can create a meal that has less than 600 calories. Those that manage to cut 500 calories from their diet each day can lose a pound of fat per week. This is the recommended rate for safe weight loss. Low Fat. Brown rice is very low in fat, containing only 9 calories from fat. This helps you to fill up on foods without taking in additional unhealthy calories that can make it difficult to lose weight. High Fiber. Each cup of brown rice has around 3.5g of fiber or around 14 percent of your daily recommended value. Fiber is essential for those that are trying to lose weight because it helps you to feel full for a longer period of time, discouraging overeating. High fiber foods also help slow the rate of digestion to help prevent spikes in the blood glucose levels that can lead to weight gain and poor energy metabolism. High Protein. Every cup of brown rice has 10 percent of your daily value of protein. Combining brown rice with legumes like beans will give you a serving of all 20 of the essential amino acids that are needed for enzyme production. This will help you metabolize foods more efficiently, allowing you to lose weight more easily. Complex Carb. Unlike white rice, brown rice still contains the hull and all the nutrients this contains. The hull provides a high amount of fiber, B vitamins and other vitamins and minerals that are essential for a healthy metabolism. Those using brown rice for diabetes are recommended to consume lemon water in the morning followed by a breakfast of raw fruit and steamed brown rice. These items should be consumed around 30 minutes apart so the body may digest each properly. At lunch, consume around 4 ounces of tofu or legumes along with a cup of leafy, green vegetables that have been lightly teamed and raw vegetables. At dinner eat a cup of brown rice with cooked vegetables and as many raw vegetables as you desire. Consume plenty of herbal tea and water throughout the day. Cook Rice Properly. To ensure that your rice cooks properly you will need to use a pan that has a tight fitting lid. Be sure to lightly salt the cooking water and simmer the rice instead of boiling. This means allowing the rice to cook on the "lowest bubble" point possible. UseLarge Pan. Cooking rice in a large sauce pan allows the heat to be evenly dispersed so the finished product will have a consistent texture. Mind the Cooking Time. If you are cooking a cup or less of brown rice, the cooking time will vary based on the nature of your stove. Brown rice typically takes between 40-50 minutes to cook completely, but you should begin to check your rice after around 30 minutes of cooking time to make sure it does not burn. GetRight Ratio. Adding the proper amount of cooking liquid will help to ensure that the rice will have the proper texture rather than becoming mushy after cooking. 2.5 cups of brown rice should be cooked in 3 cups of water while 4 cups of wild rice should be cooked in 2-2.5 cups of water.